Go beyond memorization of a teacher-provided definition, and explore content area concepts and vocabulary words. Students can include the Frayer Model in their notes or make flash cards with them, illustrating the word on one side and completing the other side. To complete the Frayer Model/Frayer Model Flash Cards, write the vocabulary word in the center. 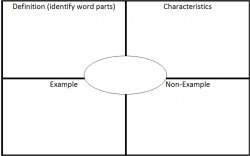 Create a definition for the work, identifying any word parts and their meanings. Analyze the vocabulary words by asking the following questions and recording your thoughts: What are some characteristics of the word? What are some examples of the word? What are some non-examples of the word?